Antique Toys Selling Well At UK Auction Houses - Where To Sell. 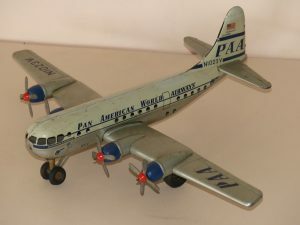 Toys like this fine Gama Tinplate Pan Am “double-bubble” Stratocruiser are continuing to see excellent results at auction, and there are major events due over the next few months – Lawrences at Crewkerne, for example (http://www.lawrences.co.uk), and quarterly at East Bristol Auctions. If you think it’s time to have some of those attic items valued, check the “Toys” category on our “Make an enquiry” page for your nearest interested intermediary. ← Cars, Automobilia, Ivory and Typewriters.